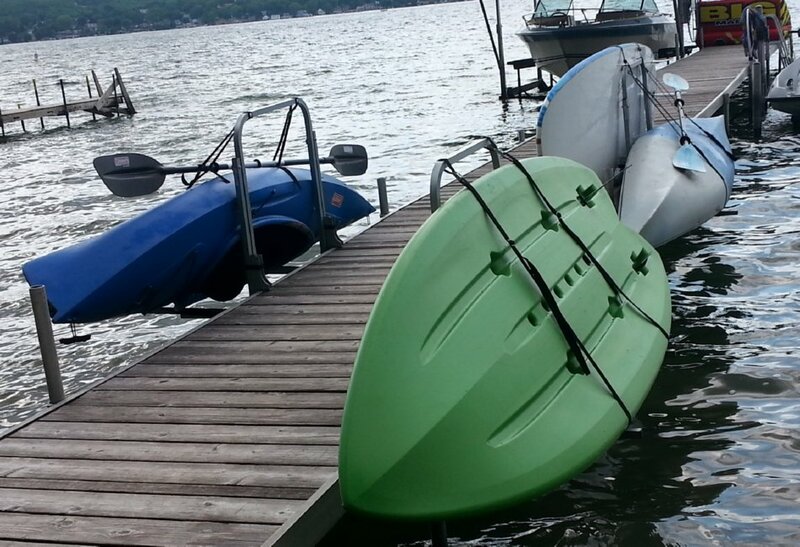 Paddleboard Dock Rack that lifts and stores your paddleboard dockside. Available for entry from the dock or entry from the water. “The DockSider” Paddleboard Lift and Storage Rack is designed for the user that boards their SUP either by water or by dock. If your water is deep or the water bottom is mucky or rocky so you get on from your dock? Select Dock Entry. The Docksider Paddleboard Dock Rack, a patented product, is made of Architectural Marine Aluminum with Stainless Steel hardware. This combination of materials is preferred to withstand your fresh water marine environment. 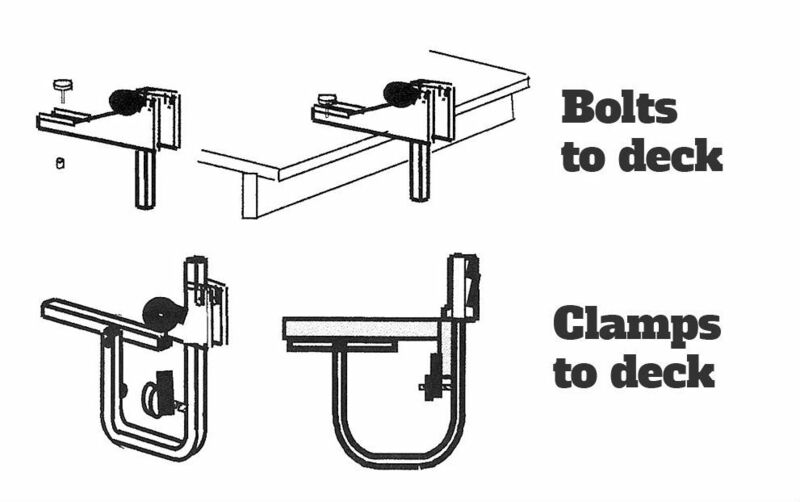 It is also available in all Stainless Steel (Bolt On Mount Only) for Salt Water Applications. It’s easy!! 3 Easy Steps – just “Load, Lift and Store”. Just rotate the SUP Cradle handle downward toward the water, Float your Paddleboard in and center to load, and then lift your Paddleboard into the storage position. Some say “Launch, Load, and Store”! Save Valuable Dock | Pier space as your Paddleboard Storage Rack holds your SUP on the side of your Dock | Pier. 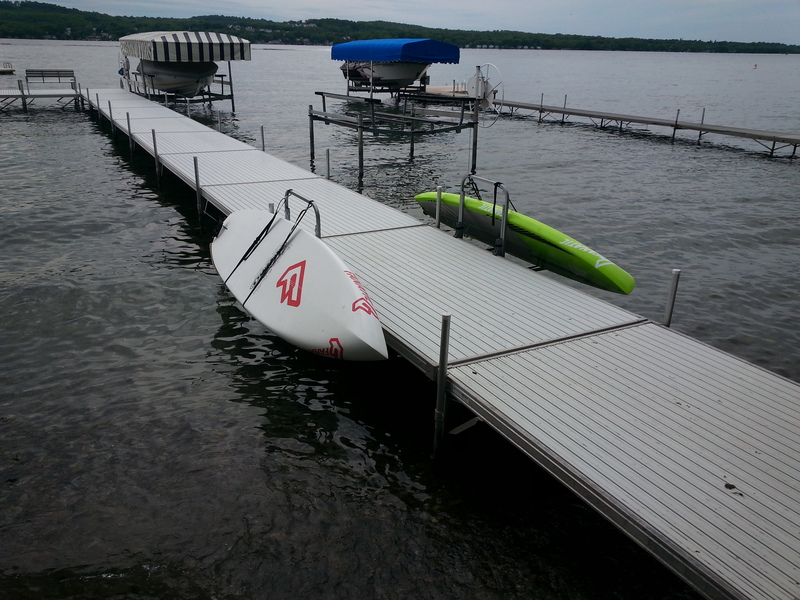 Preventing your SUPs from being obstacles on the way to the end of the Dock. 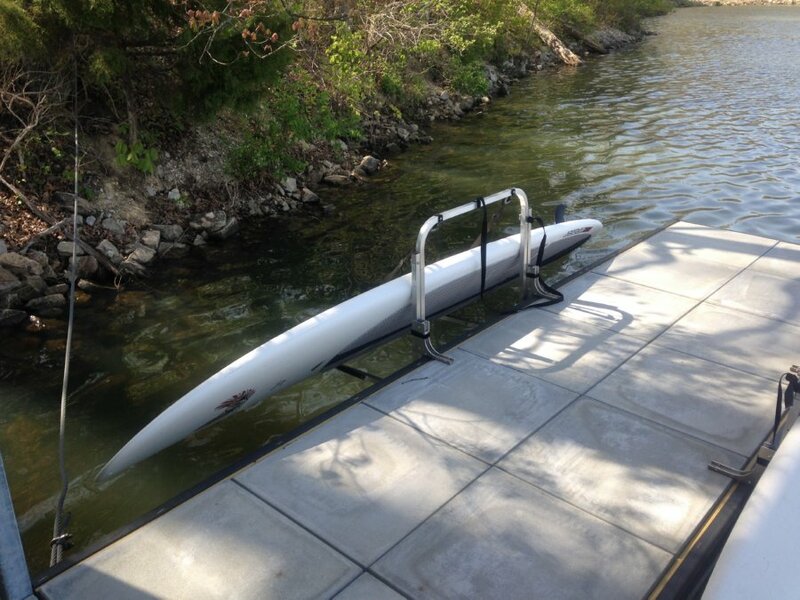 Convenient; Your Dockside SUP Rack is right where you need it; promoting more frequent usage. Saves wear on tear on you and your Paddleboard as you don’t have to lug it to and fro! Lift with a Fraction of the weight! 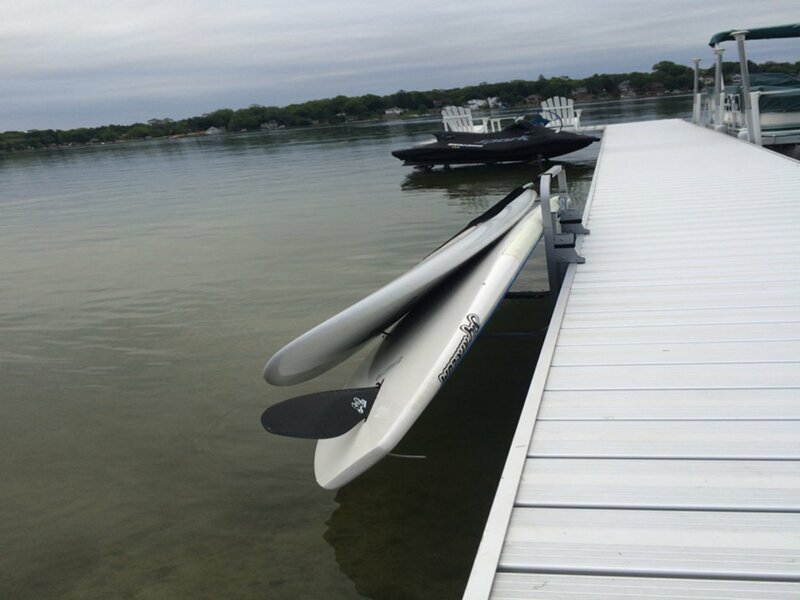 Due to the unique leverage and patented Dock Rack design, the user lifts their Paddleboard directly from the water. The lift starting at approximately 80% of the weight in the loading position (a 40lb SUP feels like 32lb). 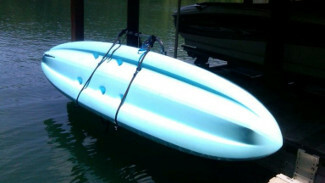 In the Storage position, the user needs to exert only 30% of the Paddleboard weight (a 40lb SUP feels like 12lb). Yes, the higher you lift, the force required lessens! There are latches you turn to keep the Dock Rack in the storage position. It Adjustable! Does your water level change from Spring to Fall? The slot and pin design allows the user to easily adjust this Dock Storage Rack to accommodate water levels of 10 – 36 inches from the Dock Decking surface! Your choice of Mounts! 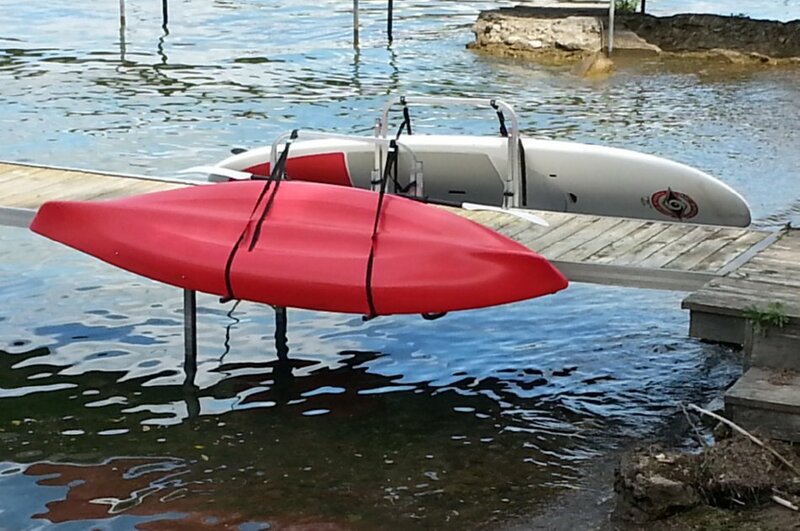 All “DockSider” Paddleboard Dock Side Rack models offer two mounting options for your Dock or Pier (Bolt On and Clamp On). 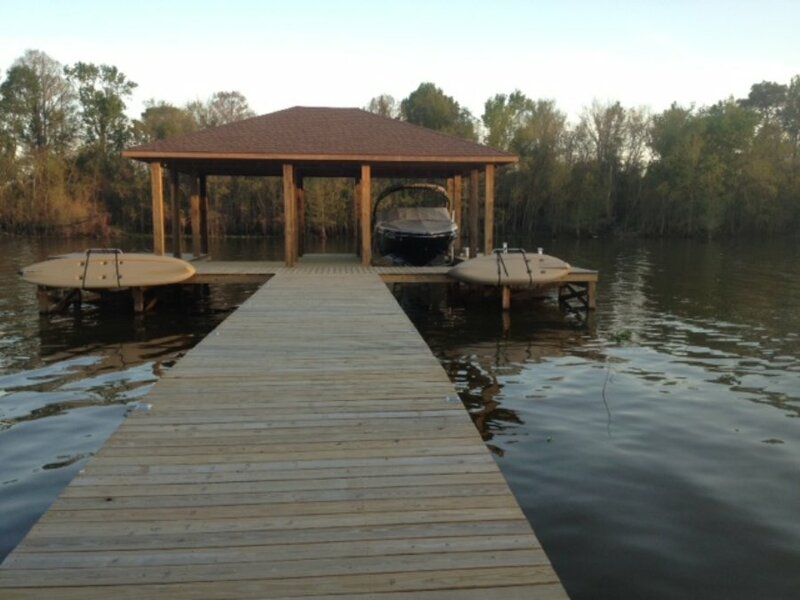 Each Dock Mount style is straight forward and easy to install in minutes. See details under Mounting Types. There are two mounting options for this kayak rack: bolt-on and clamp-on. Deciding which type you like is a matter of preference and dock type. Please review the following information. What materials are used in making your products? All structural components are made of architectural grade or aircraft grade aluminum. Hardware is typically stainless steel. How much force is required to operate the Docksider Models? The force required to lift and rotate your kayak into its storage position is dependent on the weight of your kayak and the Kayak Storage Rack you choose. Shortly after you start to lift you will reach the maximum lifting force which is equal to approximately 60% of the weight of your Kayak. The lifting force will then decrease until you reach the storage position of your Kayak; at that point the force required to hold the Kayak and Kayak Rack in place is 0lbs (zero pounds) as your Kayak Rack is in a stable resting position. – The maximum lifting weight is approximately 30lbs. 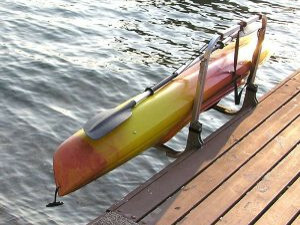 – There is no force required to hold your kayak in its storage position. 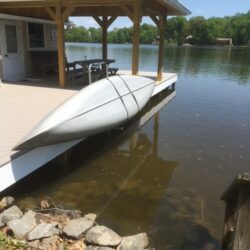 Why can’t the Surface Dock Mount be used on aluminum decking? As the Surface Dock Mount requires the customer drilling a hole in their aluminum dock decking, typically not very thick. DockCraft Industries does not want to be responsible for any structural damage that may occur. What size Kayak will fit the Docksider? 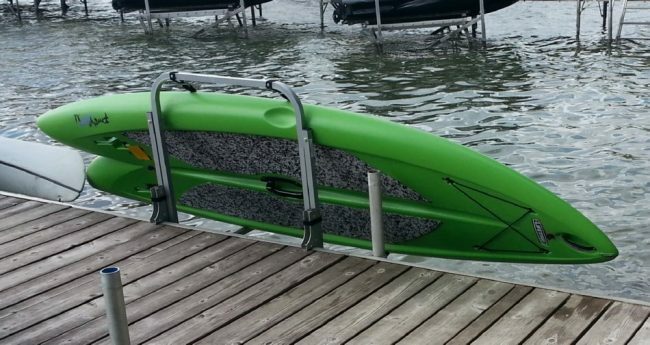 We have tested numerous models of Kayaks in our Dock Mounted Kayak Storage Racks. Kayak maximum weight of 100lbs has been determined . Kayaks with widths from 22 inches wide to 35 inches wide have functioned successfully. Kayaks with lengths of 6 ft to 18 feet have functioned successfully. I received the kayak rack and installed it thus morning. I have to say I’m impressed, it works just like the video showed. We bought one of your Docksider racks a couple years ago…. Our dock is a truss-style Floe dock, our kayaks are Old Town. I love how your rack works! Looking forward to my second one! I installed the waterside Docksider this morning. The product is even better than I imagined it could be. Install was straight forward. Load and unload of my kayak was effortless. Here are some pictures for you. Here are the photos I promised of the units installed. They work great and we use them all the time. I am using them with the “Liquid Logics” Versaboards. Thanks for all your help. Please feel free to use these photos on your website or in any advertising. We received the rack on Friday as scheduled. We installed it today! 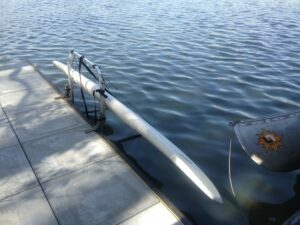 It is very handy and easy for lifting the kayak out of the water. Ed, Just a quick note to tell you that the kayak holders are awesome. I can’t believe how easy they are to use! Just what they promised and just what I wanted! We love the lifts. 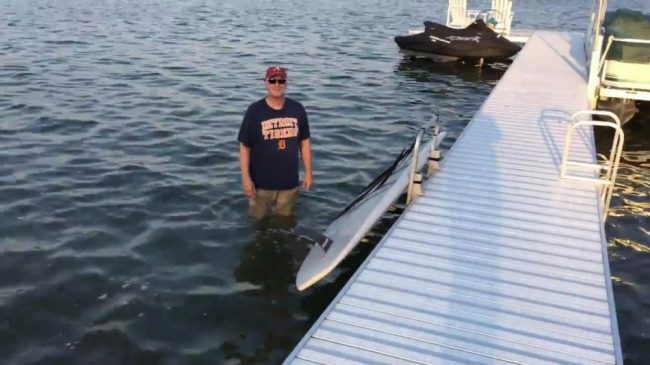 I purchased your lifts as my wife, being petite, routinely was having trouble lifting her Hobie Sport out the water and on to the prior rack due to the weight of the kayak. When lake levels dropped the reach was too much to handle. 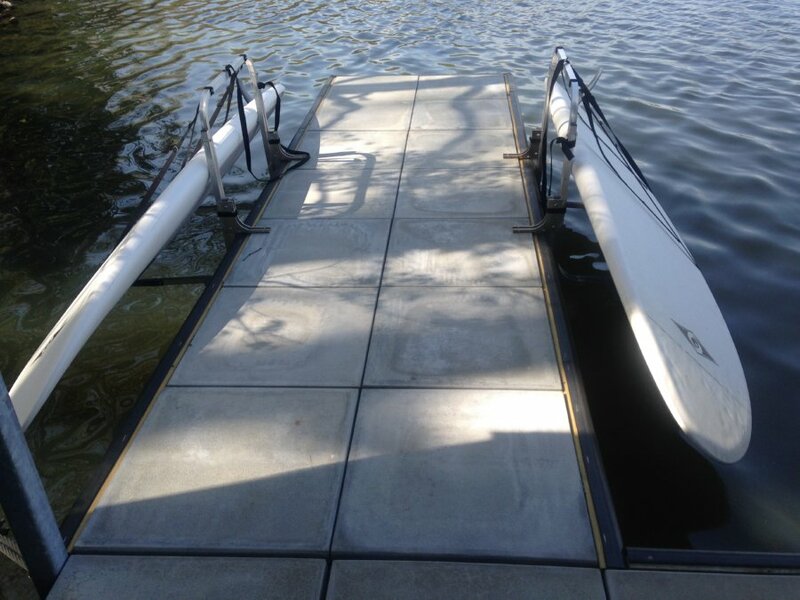 Your rack, dock mounted, works perfectly by both reducing the vertical lifting weight and allowing for modest adjustment to compensate for varying lake levels during the season. I found your design to be not only elegant but pretty simple (both in use & installation). I decided to try your approach before designing something and I am glad I did. Good job & you have a pair of happy customers! We finally set up the kayak racks (3). It took all of about 5 minutes to get them set up and we are VERY pleased!! They are sooooo slick!! Easy to install, easy to use. Thanks a million!! I just finished the install, it worked out well. I really like how easy it is to use, much better than trying to lift it onto a rack. The install went very well. I am very pleased with the ease of install and operation. Thank you for marking the straps–location was perfect. I will now use the kayak more because the rack makes it so convenient. Day after I installed, had a big storm with lots of wind, rain and rough on lake. Kayak did not budge and never wet inside. GREAT product! I have an Otter Kayak that I use occasionally. I may be calling to order another rack. Thanks again for everything and all your assistance. You have been wonderful to work with. This is Great – I love it! The rack works great – The install was easy – less than 15 minutes. I’m going to recommend this to all my friends. The lift worked great – I just ordered a second one. I’m 79 years old. The Docksider is so easy to use. Thanks! We are thrilled with our DockCraft kayak hoists (2)! The installation took mere minutes. The operation of them is very easy and has made our kayaking more fun. We have also been very impressed with the stability in some very strong winds. We highly recommend your product. Thanks! Thank You for your attentive customer service on my order. It is Much appreciated!